Swiss Things is the company's first ever pedalboard switching system. Limited-edition stompbox is inspired by "three-knob" Tone Bender circuit and boasts rare components. Effects pedal manufacturer EarthQuaker Devices has announced the new Data Corrupter Modulated Monophonic PLL Harmonizer pedal. EarthQuaker Devices has released the Erupter Fuzz pedal. We recently got the scoop on new Valentine’s Day-themed contest from EarthQuaker devices, where one lucky winner will receive a Space Spiral Modulated Delay Device. 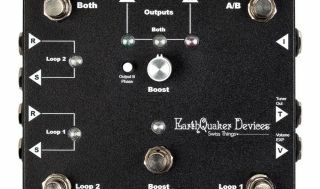 Ohio-based effects pedal manufacturer EarthQuaker Devices has announced the Space Spiral Modulated Delay. Few effects inspire creativity as much as reverb and delay (just ask the Edge, who pretty much built U2’s catalog on those effects). EarthQuaker Devices has released updated and improved versions of its top-selling Dispatch Master, Speaker Cranker, Acapulco Goldand Afterneath pedals. The updated pedals are available now. Ohio-based EarthQuaker Devices has announcedthe release of the Transmisser Resonant Reverberations device, which will beavailable for purchase October 3.